On Tuesday, St. Louisans will once again be asked if they want to make a major change to the structure of government in the city. 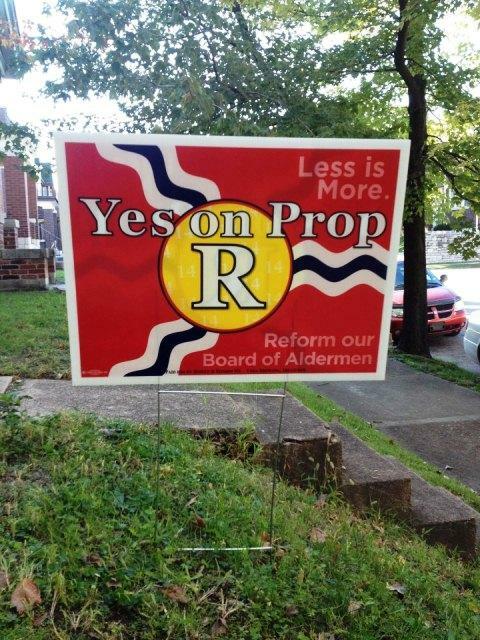 Proposition R would cut the size of the Board of Aldermen in half following the next census. The board itself put the measure on the ballot in July, just before taking a break for the summer, and the campaign in the midst of an already crowded election season began in earnest in September. It’s not that Ald.Phyllis Young wants to put some current and future colleagues out of a job. She just thinks they would do their jobs better if there were fewer of them. "It's a means of making government more efficient," she says. "Plus, I think that if you have a smaller board, there will be more communication between members of the board, in terms of what grander-scale project can they undertake as a unit." 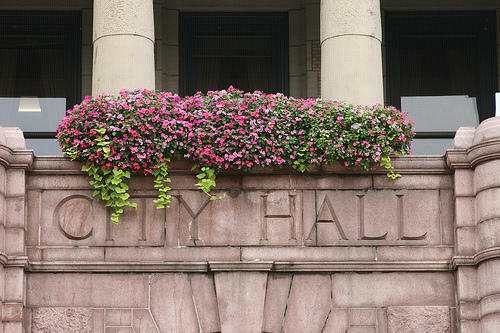 The current Board of Aldermen, with its 28 members, took shape in 1914, when the city had 687,000 residents. Nearly a century later, the same charter governs 50 percent fewer people. On Nov. 6, voters in St. Louis will decide whether to reduce the number of aldermen in the city from 28 to 14. Young, who introduced the legislation putting the reduction amendment on the ballot, is not the first person to try and downsize the board. The most recent push in 2004 fell well short of the 60 percent needed. But Young says there are signs that reduction is an idea whose time has come. "Any time we want to make a change in city government, we’re always thrown back the challenge, ‘well, why don’t you cut your board, rather than pick on us?'" Young says. "So that's what we're doing." The 14 wards called for by Proposition R would be drawn after the 2020 census. The first election in the new wards would take place in 2023. Odd-numbered wards would start with two-year terms, while the Board president and even-numbered wards would run for a full four-year term from the beginning. Passage will not be easy. Any charter reform requires 60 percent support. And Proposition R is the last item on the city’s ballot. "Good afternoon, sir. I'm your alderman, Scott Ogilvie," Ogilvie says to Todd Barnidge, one of the few residents in Clifton Heights who has answered his knock. Barnidge returns the greeting, reminding Ogilvie that they had spoken once before about Barnidge's missing trash can. "Did we get it done?" Ogilvie asks. "Yeah, it reappeared from out of nowhere. It was amazing," Barnidge replies. That draws a sigh of relief from Ogilvie, who then launches into his pitch for the proposition. "It's about changing our job description, strengthening what we do legislatively, what we do with oversight," he says. "You're far and away the best alderman we've had here so far so, if you're for it, I believe," Barnidge says. Ironically, though, it’s the ability of Barnidge to talk to his alderman about something as small as a trash can that some opponents of Proposition R give for supporting the current system. Among them is Sam Moore, who represents one of the poorest wards in the city. "Over here, it's stress. It's trouble. And there's disparity here, there's apathy here, there's wrong here," Moore said. "We're not solving the problems now, how are we going to solve them with double the people?" Similar logic led the St. Louis Labor Legislative Club to oppose Prop R. Its president, Joseph Feldman, says member unions were also concerned that fewer aldermen would open the door to the influence of big money. But Feldman says the unions never planned a major campaign in opposition. "We have a lot to take on right now," Feldman says. "We have a lot of politicians we're working with to try and get elected and re-elected. This came up on us a little quickly." Moore says he plans to pay for a robo-call to his constituents telling them to oppose Proposition R. A sample ballot he’ll hand out on Election Day will have the same message. But he lacks the funds to do much else. Supporters say residents polled in a telephone survey were either favorable or didn’t know much about the proposition. They’re hoping to get enough people informed in the last days before the election to cross the 60 percent threshold on Nov. 6. See more stories on issues and elections from St. Louis Public Radio, the St. Louis Beacon and Nine Network of Public Media at BeyondNovember.org. A measure to cut the St. Louis Board of Aldermen in half moved a step closer to reality at City Hall today. The bill cleared a procedural hurdle with more than enough votes to eventually approve the legislation. South city alderman Steve Conway supports the cut. He says he understands that some of his colleagues prefer smaller wards because it's easier to provide hands-on service. Updated with quotes from sponsor Phyllis Young. The St. Louis Board of Aldermen voted today to reduce its numbers by more than half, but city voters will have the final say. Today's vote passed 21-7 - an expected result, as it cleared a procedural hurdle June 29 with 19 votes.